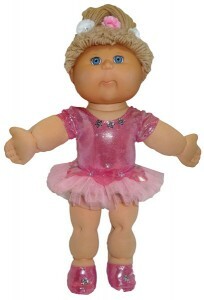 Wow, I can’t believe how popular my Ballerina doll clothes pattern has been and I’m thrilled to say it is now available in the 18 ½ “ Cabbage Patch Kids size. That’s right, my new Ballerina Doll Clothes Pattern for 18 ½ inch Cabbage Patch dolls includes patterns for a versatile leotard, a stunning tutu AND a gorgeous skirt. 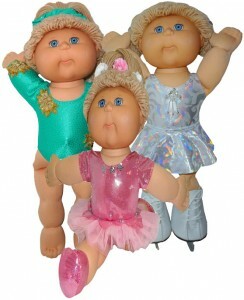 This is the ultimate pattern for dolls that love their sport, whether it’s ballet, gymnastics, ice skating, cheerleading or dancing. The Leotard is the basis for many dance costumes and sporting uniforms and because you can make this leotard with short sleeves, long sleeves or sleeveless, it is the ultimate pattern for the sporting doll. You can make it in your team or school colors, make it plain for practice time, or add embellishments to create a spectacular gymnastics or dance or cheerleading leotard. The Tutu is a separate piece so it can be worn over the leotard when your doll is performing and replaced with the skirt when at practice or warming up. This stunning tutu has a beautiful decorative feature on top of the tulle just like the professional ballerinas wear….your doll will feel like the ‘Lead Ballerina’ wearing this tutu at her next dance performance! The skirt is ideal to wear over the leotard for ballet practice, as an ice skating or dance costume, as a cheerleader or sports uniform, the options are endless. And it looks great with the overlap fastening at either the back or the front. This will be the pattern you use time and time again so get your 18 ½ inch Cabbage Patch Ballerina Doll Clothes Pattern today! Sorry, I don’t have a pattern for the CPK skates. Again, Great job Rosie! They are a cute new addition to your collection!. Thought I would send you an up date. I have now been converted and have purchased a few of your patterns. I really enjoy your videos and watch them straight after I print out the pattern and instructions. I find they will be very helpful when I go to make the outfits. I have also printed out the pattern for the pin cushion. Wonderful idea, I have to hunt for my pin cushion after I pull the pins out and it can be quite a pain. This will be my first project . 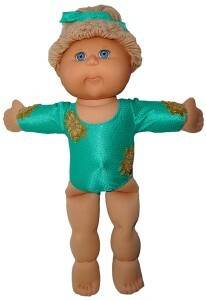 One small thing though, is the pattern for the top, worn by the Cabbage Patch, with the tights available? It is quite sweet and looks great with the tights. Thanks for your help with the downloading of the patterns, now that I have the idea I will be doing it regularly. Hi Helen, it’s great to hear that you are enjoying my patterns and videos. I don’t have the pattern for the strappy top shown with the tights available at the moment but it is certainly something I can look at adding in the future.